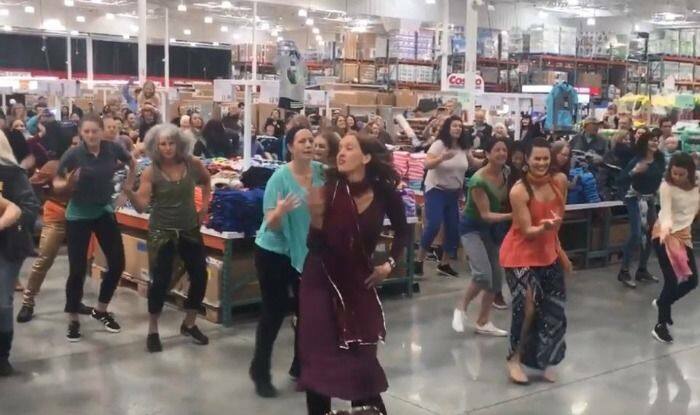 Recently, a group of people at a Costco outlet in Santa Cruz, California surprised shoppers by abruptly dancing to one of Bollywood’s most famous numbers ‘London Thumakda’ from Kangana Ranaut‘s film Queen. A video of the flash mob dancing in a supermarket went viral on social media. The name of the group is ‘Around The World In 80 Dances.’ The video was shared on their Youtube channel and in no time it went viral and now has more than 3 lakh views. It starts with a group of regular people just shopping when suddenly the music starts and the crew comes out and makes a formation and starts dancing energetically. This led to the customers to take out their phones and capture this impromptu moment which is not often witnessed. When the cameras were pointed at the viewers, you can only see smiles on their faces. Towards the end, the dancers dragged the customers as well to dance along with them.